I've seen six Christmas-themed theater productions in the last month and a half, and Theater Latte Da's annual holiday production All is Calm* comes closest to what I think is and should be the spirit of this midwinter holiday season: a celebration of our shared humanity, that transcends any perceived difference of nationality, ethnicity, religion, class, or political belief. 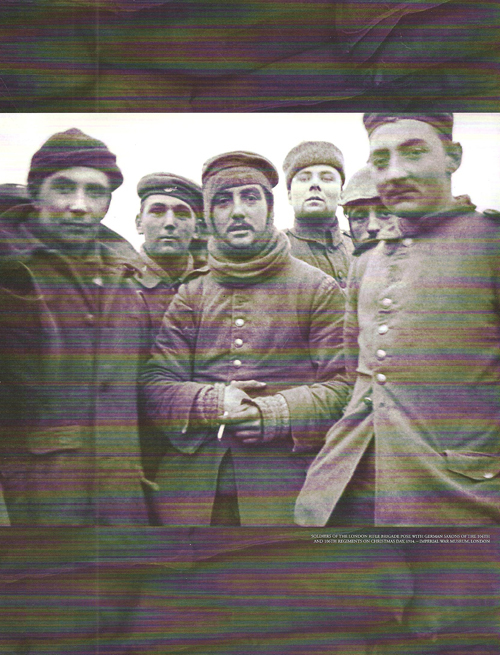 All is Calm tells the true story of the WWI Christmas day truce, through songs and soldiers' own words. If these soldiers who were sent to kill each other could put aside their differences, share in each other's joy, and make peace for one day, it gives me hope that a larger peace is possible. This quote that arrived in my inbox today seems most appropriate: "If we could read the secret history of our enemies, we should find in each man's life sorrow and suffering enough to disarm all hostility" (Henry Wadsworth Longfellow). Now in it's 5th year, All is Calm was created by Latte Da's Artistic Director Peter Rothstein and the nine-man vocal ensemble Cantus. It begins with a few traditional Christmas carols, sung in stunning harmonies. Then the theater part of the piece begins as the actors (Matt Rein, David Roberts, and Alan Sorenson) come onstage and being speaking the words of witnesses to the event, taken from letters, journals, and other historical sources from that day in 1914. Songs and words are seamlessly woven together in one cohesive piece that continues without intermission or interruption throughout the arc of the story. We begin with "The Optimistic Departure," when young men across Europe were excited to go on an adventure they were sure would be over soon. Then comes "The Grim Reality" as the difficulties and death of battle set in. The high point is the quiet celebration of "Christmas" and the blessed "Truce," as the fighting stops and men from both sides enter "no man's land" to share stories and play games. Finally, in "The Return to Battle," the war continues as if the truce never happened, and in fact it was never repeated in such a large scale, as the war continued for another long four years. All is Calm is a perfect example of what Theater Latte Da does best - weave together music and theater in an interesting and innovate way to tell a story. It's what Peter calls "intelligent musical theater," which is my favorite thing in the world. His creation is beautifully brought to life by this talented combination of actors and musicians. The three actors really embody the different men whose words are spoken, in a variety of accents. 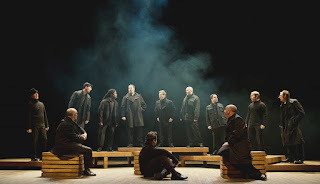 The men of Cantus, who have come from all over the country to sing together, not only sound gorgeous, but they're pretty good actors too as they become the soldiers in their joy and grief. This is truly a beautiful, moving, transfixing experience. Because of the seamlessness of the piece there is no room for applause. The audience was holding it in, which is perhaps why there was an almost immediate and deserving standing ovation as soon as the music ceased. Christmas day, 1914. Imperial War Museum, London. 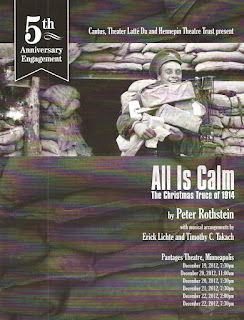 *I received two complementary tickets to opening night of All is Calm. **I can't think of a better way to begin another amazing year of theater than going back to the Pantages to see another Latte Da production, Aida, featuring one of my favorite scores, and what could possibly be the best love triangle in all of musical theater!